Script driven menu bar - full text links round the site on this page. Script driven menu bar - full text links round the site on this page. Enable active content/scripting to use the menu bar. 08/12/05 Freeman of the City! 24/03/05 HP's "disgraceful policy" attacked. 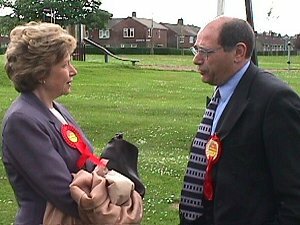 11/06/02 "Government should admit Gulf War Syndrome error"
Gerry Steinberg has said he is "touched" by a tribute paid to him at the 121st Durham Miners' Gala on 9th July. 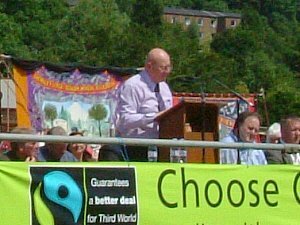 David Guy of the NUM who was introducing the platform speakers thanked Gerry, who retired at the May 2005 election, for his solidarity with the miners. "He [Gerry] stood by the miners throughout, even when it got him into trouble, his solidarity never wavered. That's Gerry Steinberg." This was followed by a genuinely warm round of applause from the large crowd gathered on a glorious summer day. "That was nice of David Guy, I'm genuinely touched"
Contents Back to front page! Gerry Steinberg has expressed his anger at HP's "disgraceful policy" and their "cover up" attempts. 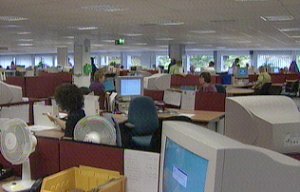 He has tabled a Commons motion urging people to stop buying Hewlett Packard office equipment and pressing for legislation to stop the "underhanded rip off". "That this House is appalled that Hewlett Packard, which is supposedly a quality supplier of office equipment, and is recommended to honourable Members, has the disgraceful policy of replacing brand new faulty equipment with refurbished models which constantly break down and, to add insult to injury, only offer a three-month guarantee on the replaced machines; recommends to honourable Members and their constituents not to purchase Hewlett Packard products, particularly when the company attempts to cover up this shameful policy by hiding behind the small print in its guarantees; and calls upon the Government to legislate to stop this underhanded rip-off." Gerry Steinberg has put down a Commons motion backing police action against footballers who display thuggish behaviour on the pitch. He supports officers who arrest players during a game for breaches of the law and says the FA's attempts to curb such behaviour are "pathetic". That this House fully supports Chief Inspector Chris Shoad of the Surrey Police Force, who has instructed his officers to arrest footballers who use threatening, foul or abusive language or gestures during a match where the referee has failed to take appropriate action which appears to be the normal approach; and condemns the Football Association for its pathetic attempts to combat yobbish behaviour on the football field, thereby allowing thugs and yobs to become role models for the nation's young aspiring footballers. Gerry Steinberg is leading the campaign in Parliament for a Miners' Memorial Day. He has tabled a Commons Early Day Motion calling for a special day to remember those who died and who still suffer providing the nation's energy. That this House supports calls for a special day when the country can remember all those who gave their lives to the mining industry, and all miners who continue to suffer from industrial illnesses associated with the hewing out of coal that was the nation's vital energy source of the 19th and 20th centuries in Britain. Gerry Steinberg has placed a motion before the House of Commons calling for the use of instant replay in football matches and looking to the day when referees can be dispensed with altogether. He says this would help stop "the incessant cheating by the players" and ensure "that a fair and accurate result is achieved". That this House believes that the standard of football refereeing in this country has declined to such a low level that it reiterates the view that modern technology should be introduced as quickly as possible by the Football Association to adjudicate incidents on the playing field including the incessant cheating by the players, thereby by-passing referees as much as possible, so as to ensure that a fair and accurate result is achieved and not one determined by refereeing blunders; and looks forward to the day when referees can be dispensed with altogether. Gerry Steinberg MP says that Labour is well placed for its first third government in the party's history. In his report to the local Labour Party, he pointed out that unlike the Tories in the 80s and 90s, Labour was holding its own in by-elections and opinion polls. Labour must get across to the electorate the extent of the government's achievements. Labour has an excellent record on the economy. People are better off, not just by accident but as a direct result of this government's careful economic policies. We now have the lowest inflation and the lowest interest rates for decades. we have the highest number of people in work and the lowest unemployment from a starting point of 3 million unemployed which Labour inherited. There has been a huge investment in public services which is now bearing fruit, all this because of the Labour government. The party needs to get across its future policies - Labour cannot rest on its laurels, but needs to tell people what is on offer. This will revolve around raising skills, continuing to improve childcare, taking action on pensions, law and order, asylum policy and public health. The party needs to mount an extensive campaign to expose the Tories and LibDems. He said he had every expectation that the Tory manifesto would be lacking in detail and not transparent deliberately so that their policies could not be costed. They would want to avoid careful scrutiny. Labour needs to expose what would happen if the Tories got in . They have had to move so far to the right to try and see off the threat to their vote from UKIP. They would introduce patient and pupil passports which would benefit the rich while most people would be worse off. They had latched on to three main issues, tax cuts, Europe and immigration. Taken together, these amount to one of their most right wing agendas ever. Labour should also expose the duplicity of the LibDems who will say one thing one doorstep and something different on the next. They are not a true alternative to Labour. LibDem Mark Oaten MP says law and order will be their main election issue, and yet they have voted against most of the government's new measures in this area. Gerry said Labour would win its historic third term and Labour would win in Durham City. Answering questions from party members, Gerry said he would vote for the Gambling Bill, pointing out that the Casinos, about which he does have concerns, were a very small part of the bill and that 90% of it was about regulating gambling and stopping under age gambling. He was asked about his recent remarks in the Public Accounts Committee to Sir Kevin Tebbit, senior Civil Servant at the Ministry of Defence. Gerry said he thought Sir Kevin was incompetent and cited two helicopter purchases costing hundreds of millions, where 67 new Apache helicopters have been standing idle for years because there was nobody to fly them - and how useful they would have been in Iraq - and the purchase of Chinooks which could not fly at night or in cloud, pilots had to rely on looking out of the window. These, bought in 1998, would not be able to be used until 2007, and of course they are dating all the time. And yet Gerry says that Sir Kevin Tebbit justifies this. Hence Gerry's forthright comments to Sir Kevin in the Committee. 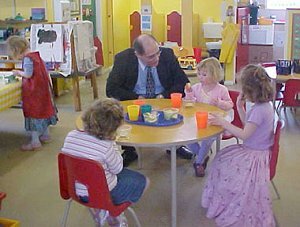 On Childcare, Gerry pointed out that before the Labour government, nursery provision was patchy and childcare almost non existent - in Labour Durham County, parents had stood a much better chance of getting a nursery place than in Tory counties in other parts of the country, many of which offered nothing. Now there are nursery places, Surestart is up and running and will be expanded under Labour. Labour's third term plans include more childcare measures. This government has lifted half a million children out of poverty, but there is more to come and the work will continue. As the Prime Minister has said, education is key to ending social exclusion and ensuring a better life for all. Gerry Steinberg has joined the ranks of MPs calling for a Commons vote on the deployment of British troops further north into Iraq. He has signed an Early day Motion which states that the danger to British troops would be significantly increased. That this House notes the United States Administration's request to send British troops into areas currently patrolled by American-led forces; is aware of the statement by the Secretary of State for Defence that he is inclined to comply; believes that such a move would significantly increase the danger to British troops in Iraq; and therefore calls for a vote in the House before Her Majesty's Government takes a final decision on this matter. Gerry Steinberg has backed calls of the DTI to abandon plans to move the goalposts on claims for the families of deceased miners. He has signed an Early Day Motion expressing concern at moves by the DTI which could exclude an unknown but potentially large number of deceased claims from recovering damages under the Coal Health Claims Handling Agreement. That this House is most concerned by what appears to be the intention of the Department for Trade and Industry to exclude an unknown but potentially large number of deceased claims from recovering damages under the Coal Health Claims Handling Agreement, notwithstanding the fact that the Agreement was designed by Lawyers for both sides under the direction of the Court and in the knowledge that in many cases medical records would not be available and that under the medical assessment process the respiratory specialists would do the best they could in arriving at a balance of probability decision resulting in a discount in compensation payable in recognition of the paucity of medical evidence; is alarmed that the DTI has moved away from the Agreement and has described cases where there is a paucity of medical evidence as unassessable claims; and calls on the DTI to go back to the principles of the Agreement under which 180,000 claims have already been processed instead of pressing ahead with a change that will damage confidence in the claims handling process. British troops in Iraq were protected more by good luck than good management according to Gerry Steinberg. He was questioning Sir Kevin Tebbit, Permanent Under Secretary of State at the MOD, about helicopter procurement. Under intense pressure from Gerry, Sir Kevin admitted that of 67 Apache helicopters ordered in 1995, the first only entered service in September 2004. The MOD had not trained the pilots to fly them. Gerry then asked why in 1997 Chinook helicopters ordered in 1995 could not fit equipment that was needed. The Chinooks still were not operational. Gerry Steinberg said that he was absolutely delighted at the result of the vote in the House of Commons last night. "After seven years of dithering by the Government, at last the overwhelming majority of members of the House of Commons were able to register their vote in a democratic way to ban fox hunting, one of the most archaic and cruel sports in England today. "I am a little disappointed that it will not be introduced more quickly. However, because it would be difficult to implement immediately, enough time is being given for the hunts to wind down. "It is now in the hands of the House of Lords to decide how quickly that happens. If they do not support the Bill that has come from the House of Commons, fox hunting will end in three months time, as the Parliament Act will be invoked on the original Bill. However, if the Lords accept the decision of the House of Commons last night it will give the hunts a year and a half to wind down their activities. So, it is in the hands of the Lords to decide how quickly it is implemented. "Finally, after seven years, Labour's manifesto commitment to allow the House of Commons to determine the fate of fox hunting has finally been fulfilled." Gerry Steinberg has blown the whistle on poor refereeing in English football and has called for 'instant replay'. The final straw came when Sunderland lost a playoff spot at the Stadium of Light - according to Gerry, because of poor refereeing. So Gerry, a keen Sunderland supporter, has shown the FA a yellow card by tabling a Commons motion calling on them to get their act together. That this House is appalled that one incompetent referee can deprive a football team of success as happened at the Stadium of Light in the Sunderland versus Crystal Palace Division One play offs; believes that the standard of English refereeing is appalling as seen every week in football grounds and on television where inconsistent and wrong decisions are made by incompetent first class referees; and further calls upon the Football Association to introduce instant playback facilities so that incorrect decisions can be rectified thereby preventing one man running and determining a match based on incorrect decisions with the resulting financial consequences and disappointment of thousands of cheated fans. Gerry Steinberg has called on the Ministry of Defence to buy British when ordering arms for British troops. He has tabled a Commons motion on this in which he says the Swiss failed to honour a contract for ammunition needed in Iraq. Gerry says the Swiss may have acted for political reasons and that British companies should be awarded such contracts to prevent British troops being vulnerable to such actions by others in future. That this House questions the wisdom of the Ministry of Defence's procurement policies, as it has been revealed that during the major hostilities in Iraq, the Swiss Government refused to honour an ammunition contract seemingly for political reasons and suspended deliveries which could have had horrific consequences; and therefore believes that any such contracts for vital equipment and goods needed by British forces, which would be used during times of conflict, should in future be supplied by British companies wherever possible. 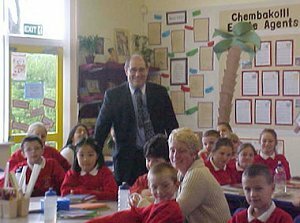 Gerry recently visited a number of schools in Durham City on 23 April 2004 as part of the "MPs Back to School Day", organised by the Global Campaign for Education and supported by the United Nations organisations UNESCO and UNICEF. One of the Schools he visited was St Hild's College CE Aided Primary School at Gilesgate Moor. World-wide, politicians visited schools in more than 100 countries, building on the success of the Week of Action 2003, when more than two million young people broke the world record for the biggest lesson. As well as raising the issue of education for all, the GCE Week of Action was an attempt to engage young people in the UK's democratic process, demonstrating the role of MPs to represent their constituents' concerns, including those of young people. Gerry Steinberg has lashed out at the latest teachers' pay proposals. That this House is concerned that there are continuing and significant recruitment and retention problems in schools and that the absence of competitive salaries for a graduate profession, and of proper professional development opportunities for serving teachers, are major contributing factors; and believes that the Government's proposals, which remove the top two tiers of the upper pay scale, severely limit further salary progression for classroom teachers and freeze the value of management allowances will be seen by many teachers and headteachers as breaking promises and serving only to further demotivate the teaching profession. Gerry Steinberg has hit out at British Airways for failing to keep up with competitors and allowing standards to decline drastically. He has tabled a Commons motion condemning the airline, once the national flag carrier, for its poor customer service, unhelpful staff and saying that travellers now seek alternatives rather than fly BA. That this House is appalled at the decline in British Airways, a once great national champion; notes that its customer service has reduced to an unacceptable level with its staff becoming unhelpful, unpleasant and uncaring; further notes that, whilst this has occurred, its main rivals have upheld their standards and even improved; calls upon British Airways to reinstate a first-class service to its customers, which includes a return of a check-in luggage facility through to final destination for all passengers, which British Midland and Virgin Airways are pleased to provide, in order to ease passenger frustrations; and notes that where it was once a pleasure to fly with British Airways one now seeks to find alternative flights with other companies wherever possible. Press Release Contents Back to front page! Gerry Steinberg has backed calls for a public inquiry into Gulf War Syndrome. A Commons motion saying the country owes the veterans a debt of honour and calling for such an inquiry has received the support of many MPs, including Gerry. Since the 1991 war, 605 veterans have died, 200 have committed suicide and over 5000 are now disabled. That this House notes with grave concern that, since the end of the Gulf War in 1991, some 605 veterans have died, 200 committing suicide, and over 5,000 are now receiving war disablement pensions for illnesses and disabilities attributed to their services; and furthermore believes that the country owes the Gulf veterans a debt of honour, and that it is long past the time that this was redeemed by the holding of a full and open public inquiry into the use of multi-vaccinations and that this debt of honour is also owed to future generations of service personnel and their families, in order to remove any doubts about the past and current procedures, and if need be, to learn from past mistakes. Gerry Steinberg has backed a Commons motion calling for greater protection for students. The motion concerns university and college owned accommodation. That this House believes that, while there are good examples of university and college-owned and managed accommodation, nevertheless thousands of students experience hazardous living conditions which adversely affect their health and studies; calls for the inclusion of university and college-owned and managed accommodation within the definition of Houses in Multiple Occupation in the Housing Bill; and supports the campaign by the National Union of Students to ensure the protection of students living both in halls of residence and in the private rented sector. Gerry Steinberg has back calls for a probe into alleged deceitful practice by some solicitors in cases of claims by former miners. He has supported a Commons motion in which some firms of solicitors dealing with chronic obstructive pulmonary disease and vibration white finger compensation claims for former miners and their families are slated for charging fees when these are already paid out of the public purse. That this House is appalled to learn of the widespread deceitful practice operated by some firms of solicitors dealing with chronic obstructive pulmonary disease and vibration white finger compensation claims for former miners and their families whereby deductions are taken from the interim and final settlement payments, some amounting to as much as £8,000, despite the fact that all the legal costs are met by the Department of Trade and Industry under the terms of the handling agreement negotiated by solicitors representing both sides; and calls on the Law Society of England, Wales and the Law Society of Scotland to advise members that the dishonest practice is undermining their professional reputation and any such deductions made must be repaid in full. In his October report to Durham City Labour Party, the city's MP Gerry Steinberg attacked the Conservatives for their latest policy announcements which would badly hurt families and pensioners. He said the Tory conference had shown that they were more and more divided and more and more extreme in their views. They are planning cuts across the board of public spending. Iain Duncan Smith is not the problem, their mean and divisive policies are. This is shown nowhere more than in the policy on the NHS. Voters will have a choice between Labour's policy of healthcare based on need and the Tories' health care based on ability to pay. The choice between Labour's modernisation after twenty years of Tory neglect, or increasing privatisation through voucher schemes. Their so-called "Patient Passport" scheme is just health vouchers under another name. The effect is that the NHS - the taxpayer - would be subsidising the rich to pay for their private treatment. Gerry went on to say how the NHS was cheaper and more efficient than private health care, citing the example of a hip operation from BUPA costing £8,000 but which under the NHS costs £4,500. Yet the rich would get the NHS to pay 60% of the £8,000 which at £4,800 is more than the total cost of the same operation on the NHS. And on top of that, the Tories plan to give tax relief to the well off on their medical insurance! The total cost to the NHS would be £2 BILLION! With no benefit for ordinary families and pensioners. Gerry then went on to point out the disarray in the Lib Dems costings for their policies. They had quietly dropped the1p on income tax (which they had 'spent' several times over) and replaced it with a high tax band of 50% on earnings over £100,000 a year. But already they were promising to spend this more than once!. On other matters, Gerry welcomed the decision by Network Rail to bring maintenance back 'in-house' and said that while re-nationalisation of train services was not on the cards, public ownership of the rail infrastructure was a big step closer. Gerry also said the agreement with NHS consultants was a step forward, but not as far as he would have liked. After intervention by Gerry Steinberg, North End residents again have their post-box back. Royal Mail have reinstalled the box just across the road from the original which was removed when the Fieldhouse Post Office closed. In one week residents lost their Post Office, public telephone and post box. And that was taken away still full of letters! 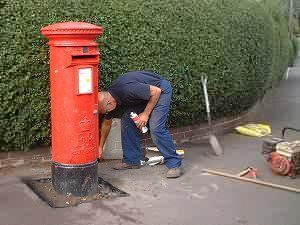 But now residents have at least had their postal service restored after Gerry took up the case. Gerry Steinberg MP has tabled two Commons motions in an attempt to protect the quality of education of children from unqualified teachers, including an appeal to the Queen. The government has laid down regulations which would permit unqualified people to work as teachers, and even oversee the work of trainee student teachers. That an humble Address be presented to Her Majesty, praying that the Education (Specified Work and Registration) (England) Regulations 2003 (S.I., 2003, No. 1663), dated 2nd July 2003, a copy of which was laid before this House on 8th July, be annulled. This was followed by a further motion expressing concern about the role of unqualified teachers. 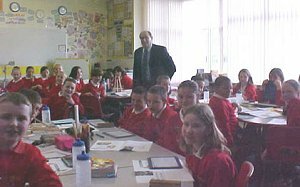 That this House believes that a well-supported, highly qualified teaching profession working alongside properly trained and valued support staff provides the best possible guarantee of high quality education for all children and young people; and is concerned that the Education (Specified Work and Registration) (England) Regulations 2003, which allow for unqualified persons to undertake the work of teachers and for persons without qualified teacher status to be responsible for the direction and supervision of student teachers could have a detrimental effect on the quality of education in the future. Although the government has timed the laying of these regulations immediately before the summer recess, Gerry still managed to get his motions down, and they have already attracted support. 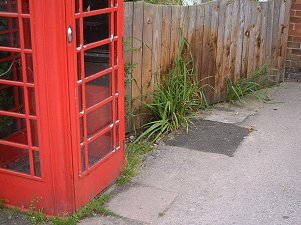 There was a post-box there, and a phone inside the box. Labour MP Gerry Steinberg is taking up the case of the vanishing facilities in North End. In one week residents have lost their Post Office, public telephone and post box. And that was taken away still full of letters! He has written to various authorities concerned to see why the box was removed without consultation, and to work for its re-instatement. Gerry Steinberg sees it as his role to work for all his constituents on all matters where he can try to help. 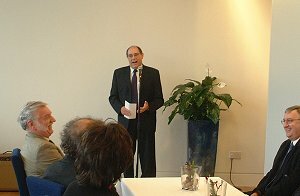 Gerry Steinberg MP has recently taken on a new responsibility. His new and demanding role is that of proud grandparent to recently born Jacob, a role which of course he shares with his wife Meg. Jacob, born in June to Gerry and Meg's daughter Lyanne is their first grandchild. Both Gerry and Meg are naturally delighted, and of course it answers one question - what Gerry will do after the next General Election! Prime Minister Tony Blair won the Best Speech category at The House Magazine Parliamentary Awards ceremony in Westminster last night. Mr Blair beat his former Foreign Secretary and Leader of the Commons Robin Cook (who was nominated for his resignation speech) and former Conservative Party leader William Hague (nominated for his speech in the Lords Reform debate) in a poll of parliamentarians. MPs and peers from all parties gathered at the Gladstone Library, One Whitehall Place, to witness the presentation of awards in seven categories: Best Speech, Best Minister, Best Opposition Politician, Best Backbencher, Best Committee, Best Peer and Best Print Journalist. Gerry Steinberg has signed a Commons motion supporting the establishment of an Older Person's Rights Commissioner. The motion makes reference to a BBC TV programme that highlighted abuse of the elderly and calls for action to promote and protect the human rights of older people. That this House believes that the human rights of older people in the United Kingdom are too often overlooked or undervalued; condemns the neglect and financial abuse of vulnerable elderly people revealed by the BBC Television series 'Britain's Secret Shame'; recognises that the majority of such cases result from a lack of understanding rather than deliberate cruelty; welcomes the Help the Aged campaign to tackle such mistreatment of older people; notes the introduction on 17th June of a bill under the 10 minute rule by the honourable Member for North West Leicestershire to establish an Older Person's Rights Commissioner to promote and protect the human rights of older people; urges honourable and Right honourable Members to endorse this proposal; notes that domestic and European anti-discrimination legislation for goods and services does not make specific provision relating to age; and calls on the Government to correct that position as a matter of urgency as part of a comprehensive effort to end the injustice endured by older people on a regular basis. Gerry Steinberg is backing a Commons motion which refuses to give a second reading to the government's to the Health and Social Care (Community Health and Standards) Bill. This is the bill which seeks to set up 'Foundation Hospitals' and one of who's proposers is Durham North MP Kevan Jones. The motion, debated on 7 May, has received the support of many 'rebel' Labour MPs who fear for the future of the NHS. That this House declines to give a Second Reading to a Bill which, by establishing Foundation Trusts and introducing other layers of bureaucracy, would increase disparities between hospitals and detract from the Government's commitment to a primary care led NHS, free from excessive bureaucracy, and believes that alternative ways of encouraging accountability in the NHS should be considered and a consensus established before legislation is introduced. The government was successful in defeating the 'rebel' motion. Gerry Steinberg MP has joined calls to the government to increase miners' pensions. He is supporting an Early Day Motion which asks the government to allow miners and the coalfield communities to benefit from £3.5 billion surpluses. That this House recognises that the Treasury is finally proposing new ways of guaranteeing miners' pensions for the future but, according to the Coalfield Communities Campaign's latest calculation is still due to take £3.5 billion historical surpluses out of the two schemes at a time when many retired miners are struggling to make ends meet; and requests that Her Majesty's Government give consideration to leaving more of the past surpluses with the schemes to be used to increase pensioner incomes and also introduce a fairer division of future surpluses in accordance with the recent asset and liability study recommendation, whilst continuing to provide support to help renew and rebuild mining communities. Gerry started by saying there were many things he wanted to report on, but that time meant he should concentrate on the more urgent matters. Gerry said that he supported the need for a second resolution at the UN before military action. He thought that Tony Blair's policy was right, and that it was vindicated by the fact that the USA had not already attacked Iraq unilaterally but had gone to the UN. He said Blair deserved credit for this and was not Bush's poodle as some have said. He said it was sad but true that sometimes war was justified and cited the defeat of Nazism as a prime example. Gerry said that the Labour government had already removed the hereditary principle from the House of Lords, which had been a Labour aim for a hundred years. But before more was done, it was necessary to clarify what the role of a second chamber would be. In the sequence of votes in Parliament on this, he had started by voting for abolition, when that failed he voted for a fully elected chamber. When that failed he voted against both the 20% elected and 80% elected options, because some kind of hybrid chamber simply would not work. A second elected chamber had many problems - would people have two MPs? This was a recipe for confusion, and the function of the second chamber needed to be thought through thoroughly before more was done. Gerry addressed concerns about the new system of benefits payments. He said that half of benefits payments were already paid into bank accounts. Fraud cost the taxpayer £3 billion a year! How many hospitals, doctors, schools etc would that fund? More than 100 pensioner s a week lose their pensions either through mugging or fraud. People will be able to use an ordinary bank account or open a new one at their local post office with a simple card to draw their cash. People needed to be reassured that they could still get their money at their local post office, maybe more publicity should be given to this. Gerry said that he had been opposed to specialist schools on the grounds of inequality and elitism. 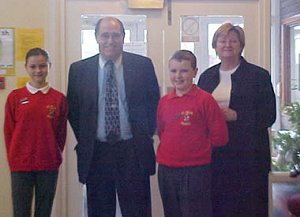 But now that this was open to all secondary schools, he was in favour because it was a way of driving more money into schools for the benefit of pupils. Of the six comprehensive schools in Durham, five already had specialist status or it was in progress, and the sixth was soon to apply. Such schools get more money and get results. He was quick to point out that although specialising in one curriculum area, they still to maintain the highest standards across the curriculum and that they were still comprehensive schools, open to all, even though a small percentage would be admitted on the basis of a particular aptitude for that school's specialism. Gerry said he remained opposed to top up fees as it would introduce a two tier system which would unfairly favour middle class and wealthier families. Gerry remains to be convinced that these would be any better than the present system. If the aim was to make them more locally accountable, the mechanism for this was not clear. How would they be more accountable? Gerry concluded by a brief reference to the achievements of this Labour government. Kier Hardie had wanted a minimum wage a hundred years ago - this government had achieved it. One could argue it was too low, but it was in place and could be improved upon. The Minimum income guarantee had helped pensioners as never before and over a million children had been lifted out of poverty by this Labour government. 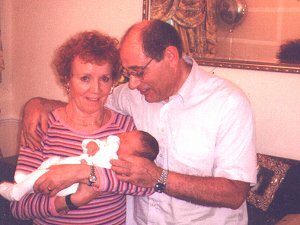 Gerry Steinberg has helped propose a Commons motion calling for tougher penalties, including manslaughter charges, for those who kill and maim by dangerous driving. That this House expresses its deepest sympathy to every family in the United Kingdom that has suffered the loss of loved ones killed by criminal motorists; notes with great concern that the maximum sentence for causing death by dangerous driving is only 10 years and that the maximum sentence for aggravated vehicle taking is only five years; believes these sentences do not reflect the heinous nature of the crimes; and calls upon the Home Secretary to urgently amend the Criminal Justice Bill, which is currently going through parliament, to enable charges of manslaughter to be brought against the perpetrators of such crimes; further believes that persons being carried in the offending vehicle could be held as accessories to the crime; and requests that when guilty persons are eventually released they are electronically monitored until they no longer pose a threat to the general public. Gerry Steinberg has joined with other MPs to protest at a possible reduction in services for retired miners and their widows. That this House is most concerned to learn that CISWO's severe funding crisis has not been addressed and that the Management Board will meet on 28th February to consider a plan for a significant down-sizing of the organisation's operation and a reduction in the services provided for elderly miners and their widows; and calls on the Secretary of State for Trade and Industry to meet the representatives of the organisation to explore sustainable funding options to ensure continuity of the service. Gerry Steinberg has lent his support to a House of Commons Motion calling for total ban of hunting. The Early Day Motion he has signed says that "only a total ban on hunting will be acceptable to this House and the public at large"
That this House notes the publication of a Bill to enable Parliament to reach a conclusion on the hunting of wild mammals with dogs; and believes that only a total ban on hunting will be acceptable to this House and the public at large. Gerry Steinberg MP has announced to his local party that he will not be seeking re-selection as the Labour candidate at the next General Election. He was making the announcement now so that the local party could consider a new candidate with plenty of time to make the right choice for Durham. He said that he has thoroughly enjoyed his time as MP for Durham since 1987 but felt that by the time of the next election in about three years it would be time to stand down. He has always enjoyed an excellent relationship with Durham City Labour Party and has always been able to say what he believed, knowing that even if it provoked strong debate, his sincerity would not be doubted and that the political arguments could be had among comrades with mutual respect. Gerry said he owed many people a debt and paid tribute to the help he had received. In response, the party meeting paid tribute to Gerry's work as an MP, to which Gerry replied that they were stuck with him for three more years! Gerry Steinberg took advantage of his monthly report to Durham Labour Party to reflect on the role of a backbench MP. He started with a quote from Jeremy Paxman who said that the life of a mule harnessed to a wheel had more excitement than that of a government backbencher. This gave Gerry cause to reflect on what as a backbench constituency MP he had achieved, and while the public perception may that of government lobby fodder, in fact there were real achievements. The public view in the chamber of the House of Commons is not typical of the work of MPs. Much of the real work is done largely behind the scenes in committees and there backbenchers can have real influence. Gerry cast his mind back to 1988 and Kenneth Baker's Education Reform Act which brought in far reaching changes to education. But Gerry, as a former head teacher in Special Education, realised that there was nothing in the bill about special education. So he suggested amendments in committee to remedy that which were adopted. Currently, Gerry is a member of the Public Accounts Select Committee which is extremely influential, as it scrutinises the efficiency of public expenditure. 95% of its recommendations are accepted by the government. Reforms to teachers' pensions and the hospital stays of cataract patients are examples, the latter now saving the NHS many millions per a year and benefiting patients as well. Also in the NHS, Gerry put forward proposals in the PAC to shorten the waiting times to see hospital consultants by ensuring referrals will not be specific to a particular consultant who may have a long list, but general so that patients may be seen by the next available consultant or even in a different hospital if the wait is shorter. This will be activated and will help large numbers of people. There are also Backbench cross party committees such as the Animal Welfare Committee. The licensing of animal sanctuaries to ensure good practice arose from such a backbench committee. Party backbench committees provide a forum for MPs to talk to ministers about policy matters, and there are regional groupings of MPs also. 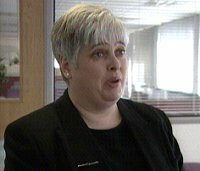 Another huge area of work is casework for local constituents, and casework has led to changes in the law, as in the case of a Durham constituent who although having lost both legs, was denied Mobility Allowance because they were capable of "walking" 10 metres with false limbs and crutches. Gerry highlighted this ridiculous rule and the law was changed. Backbench MPs also can meet and lobby ministers. Gerry gave examples including how Durham City's Millennium development had been turned down by the Millennium Commission, but after Gerry took up the case with Ministers, it was now built. Mackay's carpet factory was threatened with closure unless grants could be found to enable relocation to another local site. After Gerry intervened with the then minister, Stephen Byers, funds were released and many local jobs were saved. A local MP with his finger on the pulse of the city can use that knowledge to piece together a result that might not have occurred to others, a prime example being the new passport office in Durham. Knowing that Siemens had vacant space in the National Savings building and that they were also operating the Passport Office, Gerry approached Jack Straw with an efficient proposal that secured the new office for Durham and brought jobs with it. While an MP may not be able to work miracles, such a "mule" harnessed to the wheels of power can and does make things happen that are of real benefit to the people he represents. 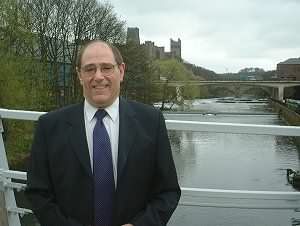 Gerry Steinberg praised the government's achievements in his regular report to Durham Labour Party on his work as an MP. He quoted Polly Toynbee as saying this government was the "best Britain has ever had" and then went on to give the reasons for this. Starting with education, he remarked on the good job that Estelle Morris had done and the principled manner of her leaving. She knew that Britain has the sharpest social divides in Europe and that children achieve according to social class as young as five. To really boost standards, we have to resolve the issues of class division in Britain. Even so, education has improved under Labour. Three quarters of children now achieve to the expected level at the Key Stage 2 SATs, taken aged 11. £670 extra per child is now spent and there are 20,000 more teachers. And the Sure Start scheme will soon start to feed results into our schools. The press hammer the NHS, but despite 18 years of Tory neglect, the NHS is being dramatically improved. It takes time. 60% more is being spent on health now than in 1997, and Britain will soon surpass the EU average. Waiting times have plummeted. 90% of cancer patients are now seen within two weeks. There are 10,000 more doctors. Labour inherited 351,000 long term unemployed youngsters - that number is now down to under 5,000. Labour's reforms continue to be based on sound economic policy. Britain is the only country in the western world increasing public spending as a proportion of GDP. Reform is coupled with investment. The Tories have already said that they won't match Labour's spending plans, "For the few, not the many", the opposite of Labour. The LibDems as ever are hedging their bets. Their idea for a local income tax is flawed. Labour needs to get across to people the extent of the improvements and make them aware of the Tory ethos of downgrading public services. Huge progress had been made by Labour in the past five or six years. Gerry said the upcoming Crime and Criminal Justice Bill would provoke debate and rightly so, but he supports it as it is needed to take action against an anti-social minority who ruin the quality of life for many families. Gerry said he supported a UN resolution for military action against Iraq (which is Durham Labour Party policy) but he does feel that Saddam poses a real threat which must be stopped. Gerry Steinberg has joined a Commons protest against cruel methods used by seal hunters in Canada. A report has said that a high proportion of seal pups are skinned alive and conscious. An Early Day Motion calls on the government to protest to Ottawa about this. That this House notes that the number of animals killed during the 2002 Canadian hunt of harp and hooded seals exceeded 300,000, and a recent study by international veterinarians found up to 42 per cent. of seal pups were skinned alive while fully conscious; is concerned that the Canadian government is now even considering an increase of the existing quota; and calls upon Her Majesty's Government to convey its gravest concerns to the Canadian government over the continuation of this hunt. Gerry Steinberg has called on the government to take swift action to restore teacher morale and make possible improvements in standards. He has put down an Early Day Motion in the House of Commons which class on the government to work in consultation with teachers and employers to reduce workloads to achieve these ends. That this House endorses the key objective of the School Teachers' Review Body in its Report of May 2002, namely the reduction of teachers' workload in order to restore morale, improve teacher retention and supply and make possible further improvements in standards; and calls on the Government in consultation with the representatives of the teachers and employers to take swift action and to allocate sufficient funds to achieve these objectives, beginning with the removal from teachers of tasks which are unconnected with teaching and learning. The relief of poverty is at the top of Labour's agenda said Gerry Steinberg in his most recent report to the Durham City Labour Party. He started by refuting the claims by Ian Duncan Smith that the Tories were now "the party of the vulnerable". Duncan Smith is further right than Thatcher. In fact, the Tories were moving away from ordinary working families, demanding cuts in public expenditure. In the House of Commons they had voted against more money for the police and for the National Health Service and in fact advocate a so-called "self pay" NHS - privatisation by another name. They would scrap the winter fuel allowance, Minimum Income Guarantee, free TV licences for over 75s and the basic state pension. He asked that people look back five years, and then they would see how far we have come - it's easy to forget. Labour has increased Child Benefit by 26%, just some of the measures introduced are the Minimum Income Guarantee, TV licence concessions, the winter fuel allowance and child tax allowances. And, for the first time in eighty years the poorest 20% of the population have seen their income grow at the same rate as the top 20%. Under the Tories, income of the top 20% was growing thirty times faster than that of the poorest 20%. Labour has lifted 4 million people out of absolute poverty. Duncan Smith would reverse Labour's policies for the many not the few of the past five years and return to the impoverishing policies of the previous eighteen years. Maureen, Gerry and Kevin (and Jolene) with the certificate. Many people would just give up, but not teenager Kevin Patterson from Witton Gilbert. Although he suffers from cerebral palsy and is blind, Kevin raises funds for the charity "Pets As Therapy (PAT)" and also regularly takes his dog Jolene to visit elderly people both in a residential home and an older persons housing complex. Jolene, a border collie, was rejected as a guide dog because she has a habit of chasing pigeons, but undeterred, Kevin has found a role both for Jolene and for himself. 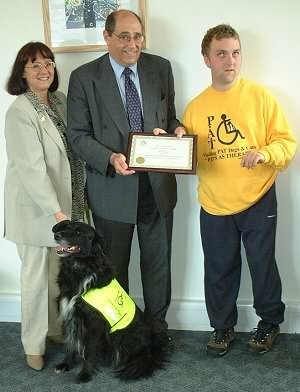 In recognition of his work, the PAT charity has made Kevin an honorary lifelong member at a presentation in Durham. PAT's Northern Director, Maureen Hennis was there to present the award, along with local MP Gerry Steinberg who has been of help to Kevin previously. It was fun, fun, fun in the sun, sun, sun for Gerry Steinberg and other MPs as they were given a makeover using cruelty-free cosmetics in the House of Commons, their toes safe from goldfish shoals. TV celebrity Shauna Lowry and comedienne Hattie Hayridge ("Holly" from Red Dwarf) were on hand to assist. It is not recorded whether fresh mango juice was available. 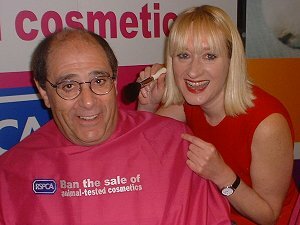 The House of Commons event was organised by the RSPCA to draw attention to the thousands of animals made to suffer unnecessarily each year in the quest for so-called "new" and "improved" cosmetics. To make the point, participants were given samples of cruelty-free cosmetics including RSPCA perfume. The event was also to apply pressure for the European Parliament's ban to be supported by the UK in the Council of Ministers. The European Parliament voted for a complete ban on the sale of new cosmetics tested on animals which will come into force five years after adoption of the new legislation. Whether Gerry and the other participating parliamentarians were feeling shipwrecked and comatose afterwards is also not recorded. And if some of the references here mean nothing to you, Red Dwarf doesn't either. That this House congratulates the Royal British Legion Gulf War Group on bringing the United States Congressional Sub-committee on National Security, Veterans' Affairs and International Relations to the House; welcomes the Sub-committee's exhaustive investigative hearings on 18th June; urges Her Majesty's Government to take full advantage of US research work in this field; notes the recent Ministerial answers to parliamentary questions tabled by the honourable Member for North Cornwall and the honourable Member for Yeovil which suggest that the Ministry of Defence still denies the existence of specific Gulf War Syndrome illnesses; and calls on the Prime Minister to constitute a full public inquiry into the causes and treatment of ill health amongst Gulf War veterans. Gerry Steinberg has joined with other MPs in expressing condemnation of plans to refuse treatment for elderly blind people until they have already lost sight in one eye. That this House is appalled by the provisional recommendation of the National Institute of Clinical Excellence that elderly patients suffering from macular degeneration be refused photodynamic therapy until after they have gone blind in one eye; regards such a suggestion as penny-pinching and arguably contrary to medical ethics; and calls on NICE to think again. "Government should admit Gulf War Syndrome error"
Gerry Steinberg has joined calls in the House of Commons for the government to admit errors made in the processing of Gulf War claims. That this House congratulates former solider and Kingston-upon-Hull North constituent Mr Shaun Rusling and the National Gulf Veterans and Families Association on their victory in achieving recognition of the existence of Gulf War Syndrome; pays tribute to Mr Rusling who has fought resolutely through thick and thin and ultimately succeeded against formidable odds in the form of the Army and the Ministry of Defence establishment that refused his just claim and continued to resist his argument for nine years; regrets that Mr Rusling was eventually forced to take action under data protection legislation to gain access to his own files; is disturbed to learn that the terms of his claim were fraudulently altered by officials of the War Pensions Agency and is shocked to discover that the Secretary of State subsequently stood by their action; takes this opportunity to express sincere regret at the pain and suffering endured by Mr Rusling; shares his deep sorrow that while government lawyers delayed, more than 500 veterans suffering from this terrible condition have taken their own lives; and urges the Government to admit that errors have been made and take immediate steps to recognise and respect the needs of up to 5,000 Gulf War sickness victims. Gerry Steinberg has backed a House of Commons call for broadband internet access to be made as widely available as possible. That this House applauds the launch of the CWU's Demand Broadband campaign which aims to raise the profile of the critical importance of broadband to Britain's economic and social well being; shares the CWU's belief that Broadband Britain provides the cutting edge for a modernising economy; notes that accessibility to broadband has improved considerably in the United Kingdom with around 65 per cent. of the country able to access broadband services but that there are only around 600,000 subscribers - less than 3 per cent. of domestic households; further notes that in February 2001 the Government set itself a target for broadband: to make the United Kingdom the most competitive and extensive broadband market in the G7 by 2005; supports the Governments commitment to rapid broadband roll-out and take-up but agrees with the CWU that the industry is unlikely to deliver universal access to broadband services and that there are risks in leaving this solely to the market, albeit with regulation, to deliver; and calls for wider consideration of how to ensure there are sufficient regulatory and commercial incentives in place to speed up broadband provision, whether a major education and awareness programme to publicise the benefits of broadband is required, whether one of OFCOM's strategic objectives to be included within the new Communications Bill should be the widespread provision of affordable access to broadband services and to what extent the substantial purchasing power of central and local government should be used, for example by making a commitment to connect every school, college, library, jobcentre and hospital in the country to broadband. 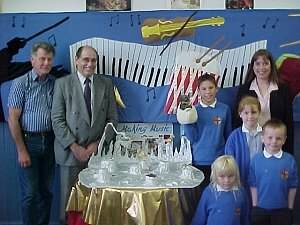 Gerry Steinberg has paid a visit to a local school which has gained a national award for its work across the arts. Browney Primary School has gained an Artsmark Silver Award for work which includes art, drama, music, design etc. Just 566 schools across the country were awarded the Artsmark, of whom 181 were silver awards like Browney School's. Sarah Taylor, Head Teacher of Browney Primary School said, "I am delighted that the Arts Council has recognised Browney Primary School's progressive, well-balanced arts education programme which enables pupils to work with local artists." Peter Hewitt, Chief Executive of the Arts Council of England, said, "Artsmark celebrates the importance of the arts in education and rewards the commitment of schools to introducing children to the arts at an early age." Gerry Steinberg has added his voice to those opposing charges at cashpoint machines. He has signed an Early day motion which points out that bank profits were £18billion last year and asks for pressure to be put on the banks over this. That this House opposes proposals by the Alliance and Leicester and other banks to charge £1.25 to customers to withdraw their own money from cashpoint machines; supports the view of the National Association of Bank Customers that many people in remote and rural areas would have no other option other than to pay such a fee; notes that the United Kingdom banking sector achieved pre-tax profits of £18 billion last year; and calls upon the Secretary of State for Trade and Industry to make urgent representations to the British bankers' Association to bring pressure to bear on those banks who are threatening to either charge for the use of their cashpoints or withdraw them from service. 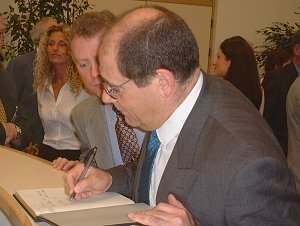 Just sixteen months after starting work on the site of Durham's new Mental Health Unit, Gerry Steinberg attended the official opening of that unit, The Bowes Lyon Unit, by the Rt. Hon Alan Milburn MP, Secretary of State for Health on Friday 3 May 2002. The Bowes Lyon Unit is named after the family of the late Queen Mother and the present head of the family, Lord Strathmore, was present. Others present were from various associated NHS and non statutory health bodies. 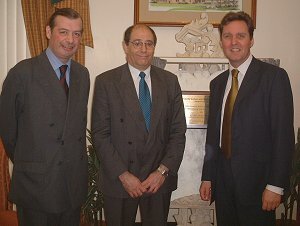 Lord Strathmore, Gerry Steinberg MP and the Rt. Hon Alan Milburn MP, Secretary of State for Health. Gerry signs the Visitors' Book, watched by Chris Parsons, Director of Facilities Management for County Durham and Darlington Priority Services NHS Trust. The £4 million unit provides up date facilities for older people with mental health problems and has been purpose built for their needs. Set in rural surroundings, it also has pleasant gardens and courtyards. The first patients moved in in October 2001. Gerry said, "This unit offers excellent facilities for older people with mental health problems for Durham and the surrounding area. I am delighted to see the project completed and helping people so quickly." An old tradition was temporarily revived in reverse when Durham City's MP Gerry Steinberg gave people one old penny to cross the River Wear. 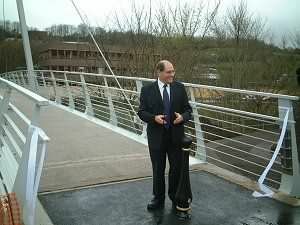 The occasion was his opening of the "Pennyferry Bridge" across the river in the city between Walkergate and the National Savings building on Friday 12 April 2002. The name was chosen after a competition revealed that it was very close to the site of an old ferry crossing for which the charge had been one penny. Phil Clark, a retired prison officer of Durham won the competition. 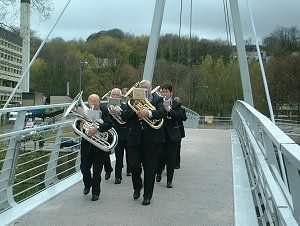 After the ceremonial of the ribbon cutting, the Bearpark and Esh Colliery Band marched over the bridge and back to mark the opening. Gerry then took on the role of toll giver and gave out one penny each to the first twenty people to cross the bridge, with the younger generation to the fore. At a reception in the Gala Theatre afterwards, Gerry was thanked by Cllr Maurice Crathorne, Leader of Durham City Council, for his part in bringing the Millennium City development, of which the bridge is a part, to fruition. In response, Gerry said he was honoured to be asked to carry out the opening. The bridge is a badly needed crossing, he said, because it would link the new hotel to be built with the Millennium Centre and the Walkergate development. Gerry was proud to have played some small part in bringing this about. He congratulated Mr Clark for finding the name, but denied ever having used the ferry in his childhood! In fact, although being Durham born and bred, the existence of the ferry was new to him. Gerry then referred to his recent Commons speech about the National Lottery where he outlined the benefits the lottery had brought to Durham, allowing such developments without it costing the council taxpayer. He praised Durham City Council for their vision in building this extensive regeneration for a part of the city that had been derelict for so long. It is now becoming a regional centre. The bridge links the riverside footpaths and forms part of a new footpath and cycle route through the city. Gerry Steinberg is still campaigning for long term care for the elderly. He has signed a further Early Day Motion on this calling for the government to recognise public concern in this area. That this House acknowledges the result of the BBC's NHS Day poll where respondents called on the Government to make free long-term care for the elderly its top funding priority; notes too the recent report of the Institute for Public Policy Research which also gave strong support to the case for free long-term care; recalls that the previous EDM 351 calling for free long-term care has been signed by 126 honourable Members by 19th March; considers that free long-term care is a vital service and recognises that its provision is of great concern to people across the whole country; and therefore calls on the Government fully to fund both personal and nursing care so that it is free at the point of use throughout the United Kingdom. Gerry Steinberg is leading the condemnation of an attack on the rights of Prison Officers to take industrial action. Gerry, whose City of Durham constituency contains three major prisons, has set down an Early Day Motion before the House of Commons condemning the government's action in serving an injunction on the Prison Officers Association and all prison officers against industrial action. "That this House is shocked that the Government has served a judicial injunction against the Prison Officers Association and every single prison officer that prevents them from advising, authorising or supporting any form of industrial action that includes even the withdrawal of goodwill and working to the security manual with the threat of imprisonment, fine and seizure of personal assets; and calls upon the Government to immediately enter into constructive dialogue with the Prison Officers Association to end this Draconian measure." Early Day Motions are a device used by MPs to draw attention to issues and to gauge support in the house for that issue. Gerry Steinberg, MP for Durham City, has lent his support to the "Right to Care Campaign". He has signed Early Day Motion 351 which calls for the implementation of the Royal Commission's proposals and says that "that distinguishing between personal and nursing care is impractical and will prove unworkable". The motion also calls for "the Government fully to fund personal and nursing care that is free at the point of use for all who need long-term care". Gerry Steinberg has previously shown his concern for carers and his support for the work of the Alzheimer's Society in the House of Commons. Gerry Steinberg is championing the cause of term time workers again. "That this House is appalled at the length of time, almost five years, it is taking for a final ruling to be made on the entitlement to benefits for mainly women term-time workers in educational establishments, particularly universities, who are laid off during holidays, up to 20 weeks per year, and who receive no pay and are denied benefits although they had been advised by the Benefits Agency when they accepted the jobs that they would qualify for benefits; further notes that during the time they are off work they receive no national insurance contributions which will have a detrimental effect on their pensions; and calls for an immediate resolution of this problem." Gerry said, "This has gone on far too long. The Early Day Motion is substantially the same as the question I asked in the last session, and is another way of keeping the pressure on to get it put right." Gerry took a couple of hours from the demands of his own campaign on 30 May to give a colleague a helping hand. Paul Brannen, Labour candidate for the marginal Tory held seat of Hexham, was campaigning in Prudhoe, and Gerry was one of several Labour candidates who turned out to help. Also there were four government ministers among well known names such as Hilary Armstrong, Joyce Quin, Chris Mullin, Alan Campbell and Ronnie Campbell and closer to home the Durham North candidate, Kevin Jones. 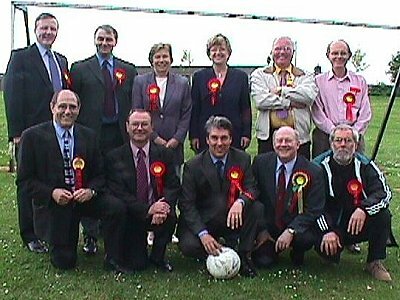 As there were eleven candidates in Labour's team on the day, the football analogy was used with the team photographed in the goalposts of the local playing fields, before setting off to canvass the local area. But Gerry had commitments in Durham to meet and after talking to some local people returned to Durham to continue the campaign. Gerry Steinberg questioned standard definitions of obesity during a Public Accounts Committee Session on Monday 23 April. The PAC was discussing the half billion pounds a year obesity costs the NHS. Nigel Crisp, the NHS chairman, gave evidence that he thought it was a problem of affluence. Gerry said that while government had a role to play, much obesity was due to people eating too much and not taking sufficient exercise. He then went on to question the definition of obesity used in the report under discussion. And on a lighter note, he complained that according to the chart, he was just two points off being "obese" and that had he not lost 1½ stone last year, he would be officially "obese". Rising from his seat to show off his new slim figure, Gerry said, "I'm not obese!" Staff celebrate while Gerry Steinberg and Pat Nolan do the digging! Gerry Steinberg has donned his hard hat once again. 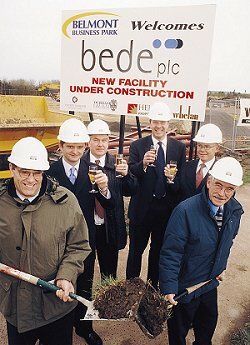 Not long after breaking ground for the new facility at Earls House, Gerry Steinberg was called on to start work for Bede Scientific's new premises at Belmont Industrial Estate on 20 April. The development on this prestigious new estate will bring 30 welcome new jobs to Durham as the company expands. Local County Councillor Pat Nolan was also there to lend a hand. Gerry Steinberg MP is one of 250 MPs who, in recognition of their unfailing efforts to improve standards in animal welfare has received a '2001 Animal Action Award' from Political Animal Lobby (PAL). Through official voting records, PAL monitored the support given by all 659 MPs on animal welfare campaigns, paying particular attention to support for the campaign to end hunting with dogs. Whilst welcoming the consistent record from such MPs, PAL condemned the behaviour of the House of Lords who on Monday the 26'h March voted for self- regulated cruelty and against the democratic will of the House of Commons and the majority wishes of the general public. PAL declared they will continue with the political campaigning to ensure hunting with dogs will soon be outlawed and was confident that they can rely on Gerry Steinberg MP to give the campaign full support before and after the General Election. 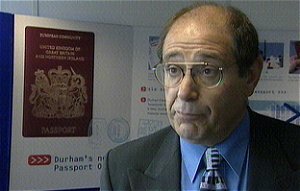 Gerry Steinberg MP at the opening of the Durham passport office. The new passport office, situated in the National Savings building is now officially open. 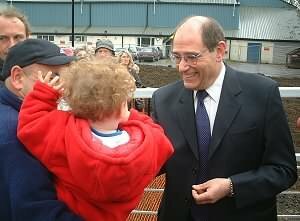 Home Office Minister Barbara Roache accompanied local MP Gerry Steinberg at the opening on Tuesday October 10th, 2000. The passport office has meant an extra 500 jobs for Durham City and is a major coup for the local MP who spent much time and effort bringing the jobs to the city. Pleasant working conditions in the new passport office, bringing a gain of 500 jobs to Durham City. People in the area will now longer have to travel as far as Liverpool to obtain urgent passports.